State politicians are governed by check-writers in the energy and telecommunications businesses, but cities are pushing back. 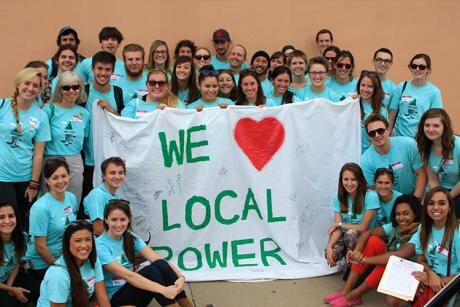 The Campaign for Local Power in Boulder, Colorado. Credit: Campaign for Local Power. As anyone who has paid a giant electric or water bill knows, utilities are big business. Today in the United States, multinational companies have bought up these formerly public institutions. In the name of efficiency and economies of scale – not to mention profit– many cities have sold their electricity generation stations, given up on public transport, and privatized their water. Corporate management of previously public goods has led to dreadful human costs: from scores of low income residents of Detroit having their water turned off to some of the highest internet prices in the world. It has deprived citizens of the right to collectively decide how to administer urban services, or to control levels of environmental sustainability. This disempowerment of US urbanites has been two-fold: first, by the Reaganomics doctrine of mass privatization and, second, by state governments, which are often more conservative and less inclined to embrace policy experiments. However, things may be changing. With frustrations growing over the cost of municipal services and their ecological sustainability, cities have started to fight back, starting a process of 'municipalization'. Mayors and city councils, spurred by grassroots activism, are experimenting with green public energy, improved rail service, and even reinvesting in public housing. From the left-wing Bill de Blasio, of New York, to more-conservative midwestern mayors, municipal governments are returning services like internet, electric, and housing to the public domain. A signature aspect of de Blasio's vision for New York is to create hundreds of thousands of units of affordable housing in order to shrink the difference between the 'Tale of Two Cities': one defined by poverty and precarity, and the other by penthouses. Most of the projects involve some degree of public-private partnership – in the form of social impact bonds or subcontracting – but all of them restore control to cities and their citizens. For decades, people living in American cities have felt marginalized by divestment in housing and transport: often at the behest of state politicians unfamiliar with the routines of urban life. What's more, urbanites – who are overwhelmingly in favor of Keynesian economics and social programs – have felt victimized by companies that administer state-granted monopolies for services like gas, electric, water, and internet. In contrast to Europe, public investment for solar and wind energy is abysmal. The US Department of Transportation has consistently warned that if cities cannot find funds to update infrastructure there could be fatal consequences. The cumulative effect of divestment in municipal services and infrastructure is a sense amongst city dwellers that they are already living in a semi-dystopia bereft of basic services. But for this same reason, many people living in cities have embraced projects that rely on collective action and community-based decision making. On the small scale, this could be an organic garden, but others wish to scale-up these actions to include, for example, fair housing provided by community land trusts, nonprofit high-speed internet, and ecologically-sustainable and publicly-administered electricity. Today, cities are taking advantage of their policy autonomy, unlike states – which often use their federalist powers to subvert forward-thinking legislation around racial integration, environmental protection, or healthcare. They are pushing back against Congress' lack of action on corporate profiteering from the public sector and climate change denial. What that means for average citizens is that while their confidence in Congress plummets, they have found local governments closer to home that seem to be willing to experiment and address the harder environmental and economic issues. Towns like Boulder, Colorado are buying back their electricity grid in the name of greener energy and lower prices, while other cities in Colorado and California are investing in rail transit. Communities are embracing this movement as a way to rekindle the notion that public ownership can help to secure services – like internet access, electricity, and housing – as social rights. In the past two years, we have seen a bounty of new policies emanating from cities that address problems long-ignored by the federal legislature. This includes: IDs for undocumented immigrants (New York City), housing for the homeless (Salt Lake City), and a liveable minimum wage (Seattle). With gridlock as the prevailing creed of national legislatures and laissez-faire economics as the chant coming from most statehouses, cities have been surprisingly militant in their drive to push through creative new policies. Nothing exemplifies this more than new utilities created at the municipal level in order to lower consumer prices for internet and electricity and to push for green energy. In February, along with coming out for net neutrality, the Federal Communications Commission (FCC) upheld the right of municipalities to create their own public internet utilities, reversing state laws that forbade this. This seems like a logical ruling. Yet in Wilson, North Carolina, residents had to fight to keep their newly-formed public internet after legal challenges from Time Warner. Wilson created their public internet (called Greenlight Community Broadband) in order to better serve rural residents and to lower rates. Time Warner was so indignant with this action that they spent millions on litigation to challenge the legality of Wilson's program, as well as against a larger experiment in Chattanooga, Tennessee. Despite deep pockets and support from market-fundamentalist state legislatures, Time Warner lost. Other communities are realizing their collective interests lie in increased direction over the energy market. Good examples of long-term models are San Antonio, Austin, and Sacramento, which all operate municipal power companies with competitive rates. They are inspiring other cities that gave up their utilities a generation ago. Advocates like the Institute for Local Self Reliance maintain that municipal energy programs reverse the trend of privatization and corporate ownership, which helps reduce prices by removing profit motives. They also contend that many cities were actually losing money moving power regionally and maintaining a larger-than-necessary infrastructure. This is a viewpoint that should make a lot of sense to Republicans, who espouse the virtues of the Jeffersonian model of small government, with high participation at community level. Yet both Democrats and Republicans are beholden to check-writers: many of whom are in the energy or telecommunications businesses. But as grassroots coalitions for responsible energy and community internet show, people do want to get involved in local projects that produce tangible community goods. Many find this a welcome antidote to the usual forms of participation which concentrate on electoral campaigning. Other cities have experimented with municipalization of their energy for more altruistic, less-budget related reasons. Boulder in Colorado is a perfect example. Boulder, a college town which sits at the foot of the Rocky Mountains, is well-known for a progressive spirit and a strong sense of environmentalism. Citizens there recently approved two ballot measures that pave the way for de-privatizing the electricity grid in order to become less reliant on coal-burning and utilize more solar power. This move was vociferously fought in court by the current energy provider, Xcel, a company from Minneapolis, which has spent millions of dollars contesting the city's right to buy the power grid and administer its own electricity. Boulder's attempt to wrestle back control of their power is not a protest against high bills, but against the pathetic status quo of green energy in the United States: even in Colorado ample sun and a powerful conservation movement has not made much impact on quitting carbon. Boulder is rated as the healthiest city in the country, with the most bike paths, and many people have wondered for years why their energy plan could not look more like them: fit, slightly unconventional, and environmentally attuned. Now, with citizen-led movements that address energy, internet, and transport as collective goods– to be deliberated by communities– they have the opportunity. Cities like Boulder, with high per capita income, are in a good position both to municipalize and to attract investors to buy municipal bonds in order to support future experimentation. Boulder has already spent 10 million dollars, approved by taxpayers, to assess the feasibility of a public alternative. The results are promising. Boulderites hope to finally harness the greenest energy available and not, like private utilities, to simply extract green dollars from bill-payers. The fight for municipal utilities is an important kind of localism that dumps the fatuous proclamations of the Republican Congress on the subject of the glories of small town America and actually tries to get down to business. Long before America's cities were demonized as paradises for crime and drugs (and consequently reborn for yuppies interested in grit and nostalgia) they were centers of policy experimentation. From Hull House's poverty alleviation in Chicago to the New Deal public works in Fiorello LaGuardia's New Deal New York, American cities have a strong history of experimental projects that utilize public control. Some of these programs, like the much-maligned, now-destroyed public housing projects of Chicago and Saint Louis, did not work as planned. But the legacy of animosity toward all public ownership has been disproportionate to its failures. Also, the American anti-collectivist standpoint has never reckoned with the quieter, but no-less-pernicious, effects of the private sector squeezing all-profit-possible out of public services. Cities, like New York under Mayor Bill De Blasio, have decided that there is no more standing on the sidelines and public investment in housing, infrastructure, and services must come now.They did not get to this point by accident. Rather, too many people felt the financial pinch of high bills or saw sooty skies and unclean water and wondered how this kind of neglect was possible. By taking community control, many cities have seen that they can move towards clean energy and fair prices for basic services independently without waiting for answers to 'trickle-down' from Washington DC.